A little bit of background: my husband is from a small town in Illinois. It’s not close enough to Chicago to be considered a suburb, but not really part of what’s considered “Central Illinois” either. It’s known to locals as the Illinois Valley, but that doesn’t mean a whole lot to people not from the area. I grew up in a Chicago suburb that had zero history. I mean, the “historical district” is a set of houses built in the 1960s. There are nearby suburbs with more history, but my town had been farmland for a very long time and it is seriously lacking in old time charm. Perhaps that’s why I’ve always been so drawn to places with old brick downtown sections and interesting historical tidbits. My husband’s corner of Illinois is chock full of these types of stories, which I’ve been gobbling up since we started dating 14 years ago. One of the stories he told me took place in the town right next door to his in Ottawa, Illinois. We were driving past the old Westclox factory one day (which is technically in Peru, another nearby town, but I digress) and he told me that back in the day, the dials of the watches made for Westclox were painted with radioactive paint and that it made a lot of employees sick. (To be fair to Westclox, these were third party dial painting operations, though, I’d be surprised if they didn’t have some problems with the radiation too, because it’s friggin’ RADIATION.) The mysterious sickness was due in large part to the fact that the workers were instructed to put the paintbrushes in their mouths. 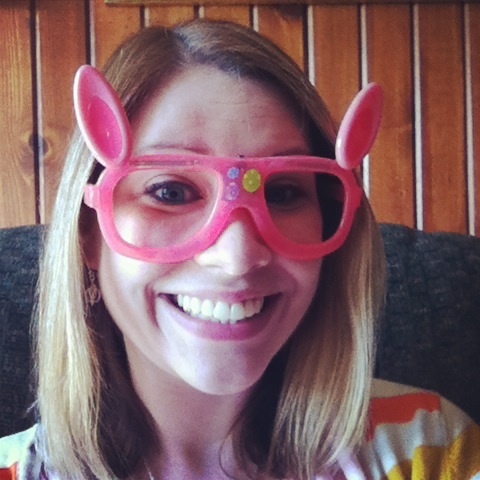 I was SURE my husband had gotten part of the story wrong, because seriously. I don’t put paint in my mouth, let alone radioactive paint. I thought it had to be an urban legend. It. Was. Not. An. Urban. Legend. 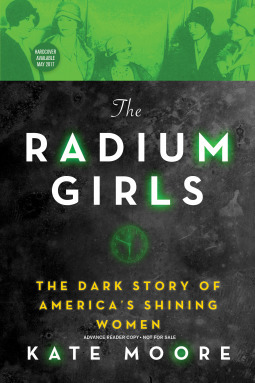 The Radium Girls by Kate Moore is a fascinating account of what went on in these radium dial factories, both in New Jersey and small town Illinois. Women in the 1910s-1930s were employed in factories painting radium infused glow-in-the-dark material on watch dials and other clock faces. Toward the beginning of this time period, radium, in small amounts, was considered to be safe, and possibly even healthy. Workers were instructed to put those radioactive paint brushes into their mouths in order to get a precise point for the fine detail work. Yes. This is a real thing that happened. I’m still trying to process it. Of course, a few years into this practice, it became clear that all was not safe and healthy where radium ingestion is concerned. The girls (and I say “girls” because some were as young as 14 and they usually left the company by their early 20s) began coming down with mysterious tooth and jaw ailments, muscle pains, and scores of other symptoms. And, as corporations are wont to do when they’re in jeopardy of losing a crap load of money, they tried to blame anything else (STDs, bad luck, other diseases) for the girls’ ailments rather than take responsibility. The book covers the processes used in the factories, some rather gruesome details about the effects the women with radium poisoning suffered, and the legal battles that followed in order to get the women some compensation for having bits of jawbone fall out all over the place. It all just hit SO close to home considering that I’ve spent a decent amount of time in Ottawa. I’ve driven past Saint Columba, the church many of the girls attended, oodles of times. In later years, Argonne National Laboratory began doing followup studies on the remains of the women who perished and survivors of Radium Dial. The cancer rate for survivors was something like 80%, and they were cancers so rare that they couldn’t have been caused by anything but the radium poisoning. The remains of early victims have been studied as well and are, to this day, highly radioactive. It’s estimated they will be for another 1500-3000 years. For the love, you guys, READ THIS BOOK. It was amazing and informative and it never dragged or got too bogged down in the science the way some non-fiction does. The human stories abound. It’ll break your heart. You’ll learn things. It’s amazing. The Radium Girls by Kate Moore. All the stars. Talk to me, Bookworms! Do your hometowns have any tragic and or fascinating stories? Woah, that sounds interesting! Putting on my tbr list! The women painting put the brush in their mouth to get a point on the brush for better painting. Yep! Aunt Barb, that’s it exactly. I just couldn’t believe it when Jimmy first told me about it. Radium aside, regular old paint would leave you looking pretty weird when you left work for the day if it were all over your lips, I just couldn’t fathom it! Apparently it was a technique commonly used in painting china and fancy dishes and was adopted by the dial painters. The things I learned from this book! I’ve read a short version of this in a couple of other books so I really do want to get this one for the full story! It’s shocking how people are willing to work with substances before they know what the consequences might be. This is kind of a common thread through history. I’m from that area too! I remember my mom telling me about the radium girls as a kid. Did you hear the author’s going to be in Ottawa later this month? This is the next book on my list of books to read this month. I have had the e-galley for months now and have been really looking forward to it. I am so glad it seems to live up to my excitement about it! Holy crap. This sounds morbidly amazing and terrifying and interesting and YES. Right up my street.